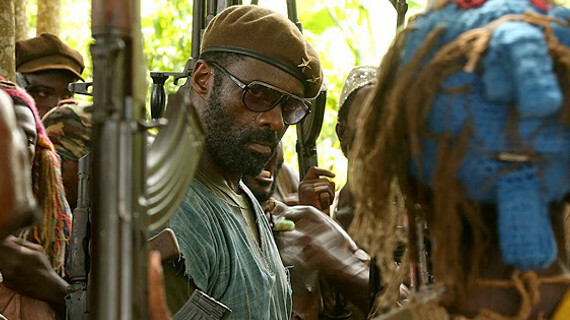 Like Hansel, Idris Elba is just so hot right now. I first saw him in The Office in 2009 as Charles Miner, the hunky new manager who Jim just could not possibly impress. And that’s really as recently as his success began, with small roles in 28 Weeks Later, American Gangster, RocknRolla, and finally a breakthrough performance opposite Beyonce in Obsessed at the age of 37. But it all started rolling from there: Thor, Prometheus, Pacific Rim, Mandela, No Good Deed, The Gunman, Age of Ultron, and now Beasts of No Nation. There’s even talk of Elba becoming the new James Bond when Daniel Craig retires the role, something the 43-year-old Brit could definitely pull off. He’s impressed us all with his speedy rise to stardom, and has never showed more dramatic talent than in this film. In an unnamed African nation, civil war rips apart the fabric of countless lives, creating an all to0 typical tapestry of death. Agu lives in a small village with his mother, father, and siblings, where they are poor but safe. The war that threatens the countryside is an ever-present shadow over their days, but they manage as best they can, take refugees onto their land, and hope for the best. But when all order collapses at the capitol, no one is safe. Agu’s mother flees with the younger ones, his father & brother are killed, and this scared boy must fend for himself in a world where nothing makes sense. Picked up by a band of rebels who patrol the forests, Agu becomes a member of a strange brotherhood led by the Commandant, the king of an insane kingdom of imagined glory. It’s rare to see digression painted so perfectly, with a parade of scenes showing us one step forward and two steps back, the complete loss of humanity that so often appears in the wake of war. A quiet village, approaching battle, sudden death, abandonment, forced service, death on all sides, abuse, abasement, and the disappearance of all the good life has to offer; it’s a difficult film to watch, made especially so by having a young boy as the main character. We are showed a fiction of what is the truth for too many people and too many countries, prohibiting us from turning our heads. With a solid performance by amateur actor Abraham Attah and perhaps the best we’ve yet seen from Idris Elba, Beasts of No Nation becomes a must-watch film for both its message and its strong delivery.